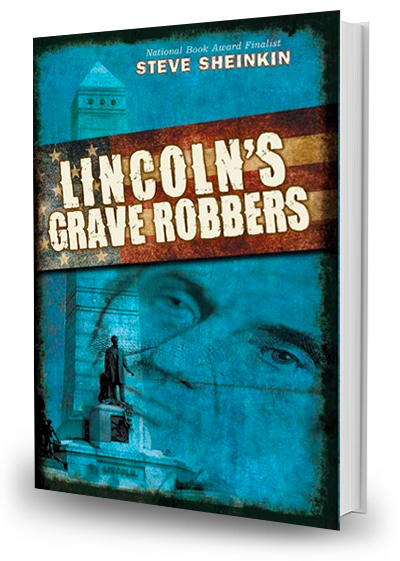 A true crime thriller of the brazen attempt to steal Abraham Lincoln’s body! The action begins in October of 1875, as Secret Service agents raid the Fulton, Illinois, workshop of master counterfeiter Ben Boyd. Soon after Boyd is hauled off to prison, members of his counterfeiting ring gather in the back room of a smoky Chicago saloon to discuss how to spring their ringleader. Their plan: Grab Lincoln’s body from its Springfield tomb, stash it in the sand dunes near Lake Michigan, and demand, as a ransom, the release of Ben Boyd and $200,000 in cash. From here, the action alternates between the conspirators, the Secret Service agents on their trail, and the undercover agent moving back and forth between the two groups. The plot moves toward a wild climax as robbers and lawmen converge at Lincoln’s tomb on election night: November 7, 1876. Teacher’s guide, reviews, and more at the publisher’s website! Get Signed Copies of This Book From Steve’s Local Book Shop, Northshire Bookstore!